It's never the wrong time to join Burneside Tennis Club. We offer pro rata discounts on any membership taken out during the year. Members receive AGM minutes, our newsletter and membership renewal forms in March each year. The full membership year begins in April. We are a small friendly tennis club. Members play social tennis and have access to use the courts at other times. We run a veterans [over-40s] team in local leagues. Burneside is a village 2 miles north-west of Kendal. The club has been here since 1950. The courts are on the edge of the village, alongside a recreation area and farmland. We have 2 hard courts, recently resurfaced in September 2016 and repainted in May 2017. There is a small clubhouse with a toilet. Visitors may play by the hour (£6 per court, racquets and balls available). Court keys available at Burneside village shop. Why not come along and see us? We'd be glad to give you a tour and tell you more about the activities and facilities. As well as local residents, regular visitors with holiday homes in the Kendal area also join the club. Contact us below to arrange a visit. Accessibility: the car parking area [unpaved] and courts are on one level , so are suitable for wheelchair use. 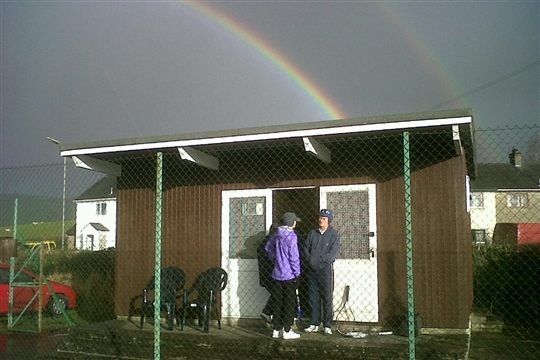 We regret that there is no wheelchair access to clubhouse or toilets. Court bookings: there is no formal bookings system. Team matches* ,social sessions** and coaching*** take priority [see Teams tab for match dates]. Both Pay and Play and regular members may reserve a court by calling the village shop on 01539 735287 and requesting it be entered in the diary.